Essential items to stop life-threatening bleeding. The ResQ-PAK™ is a compact, durable kit of the essential items you need to stop life-threatening bleeding (for yourself or a buddy) until medical help is available. Designed to fit neatly and comfortably in a suit jacket, vest or BDU pocket, the ResQ-PAK™ is always ON you when you need it (and not left behind in the car). Pocket sized personal first aid kit for emergency self-treatment of gunshot, knife stabbing, car accident, sport and other traumas. Be proactive! Be prepared! 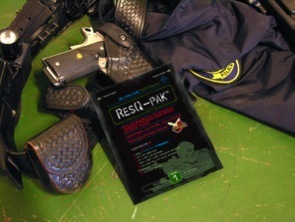 The Level 1 ResQ-PAK is recommended for plainclothes, protection detail and patrol. Contains Quik-Clot t® hemostatic agent. 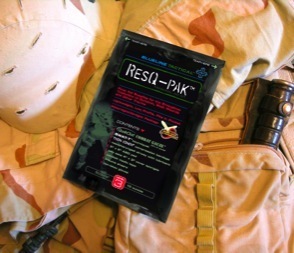 The Level 2 ResQ-PAK is recommended for patrol, high-risk warrant service, and tactical. Contains Quik-Clot t® hemostatic agent. 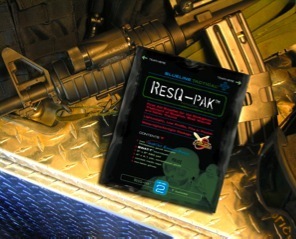 The Level 3 ResQ-PAK is recommended for tactical and military. Contains Quik-Clot® hemostatic agent.